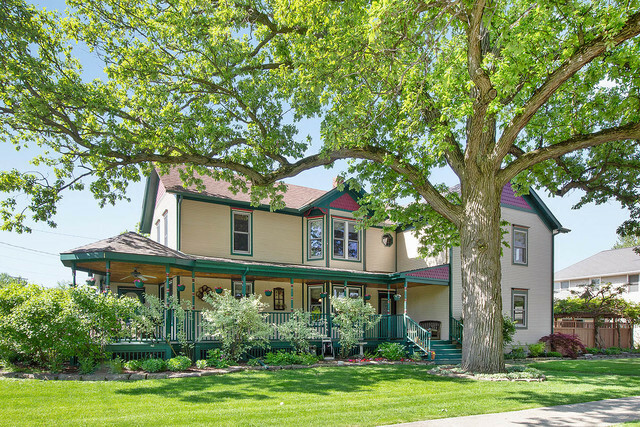 Stunning Victorian beauty in historic Lemont blends old world character with todays most sought after amenities. Charming covered wrap around front porch adds additional entertaining space. Formal dining room with original wood sliding doors. Large living/family room with hardwood floors and built in book case. Huge open kitchen with island, beautiful cabinetry, walk-in pantry and separate eating area with additional cabinets/counters. Beautiful master suite and lavish bath with a whirlpool tub, separate shower and custom vanity. First floor bedroom/office and adjacent full bath. 4 spacious bedrooms and office on 2nd floor. Finished basement feels like the north woods with a ventless gas stove, laundry room, huge workshop and storage areas. 1400 sq. ft. addition was added to home in 2000. Lovely fenced back yard oasis with limestone patio and custom bar. Prime location adjacent to park, minutes to the library, schools, METRA, dining and expressway access. One of a kind home!